Howard Pyle (1853-1911) was one of America’s most popular illustrators and storytellers at the end of the 19th century during a period of explosive growth in the publishing industry. His illustrations appeared in magazines like Harper’s Monthly, St. Nicholas, and Scribner’s Magazine, gaining him both national and international exposure. The broad appeal of his imagery made him a celebrity in his lifetime. Pyle crafted a unique approach to the art of illustration by immersing himself in the art of his time. In addition to viewing original works of art in public and private collections in Wilmington, Delaware, Philadelphia, Pennsylvania, and New York, Pyle absorbed contemporary imagery through illustrated periodicals and books, reproductive prints, and fine art (photomechanical) reproductions. All of these were available to him via the burgeoning international trade in prints and publications. Pyle adapted his technique to suit the story being illustrated, drawing on a broad range of styles, including Pre-Raphaelitism, Aestheticism, Symbolism, and American realist painting. His success as an artist was enhanced by his audience’s knowledge of and appreciation of the many American and European sources that he referenced and quoted. And his remarkable versatility situated him solidly within the conversations that defined the art world of the period. Pyle’s body of work includes images of European history from the classical period through the 18th century. His depictions of the ancient world echoed an interest in classical subject matter prominent in academic painting in Europe. He was particularly fond of the Middle Ages and wrote and illustrated several works set in medieval Europe and England. Among these are Otto of the Silver Hand (1888), The Story of King Arthur and his Knights (1903) and The Story of the Champions of the Round Table (1905). The wood-engraved illustrations for these works clearly reference Pre-Raphaelite illustrations of the 1860s from which Pyle would have had ample exposure, both through prints and illustrations, as well as first-hand in the Wilmington collection of his contemporary, Samuel Bancroft. 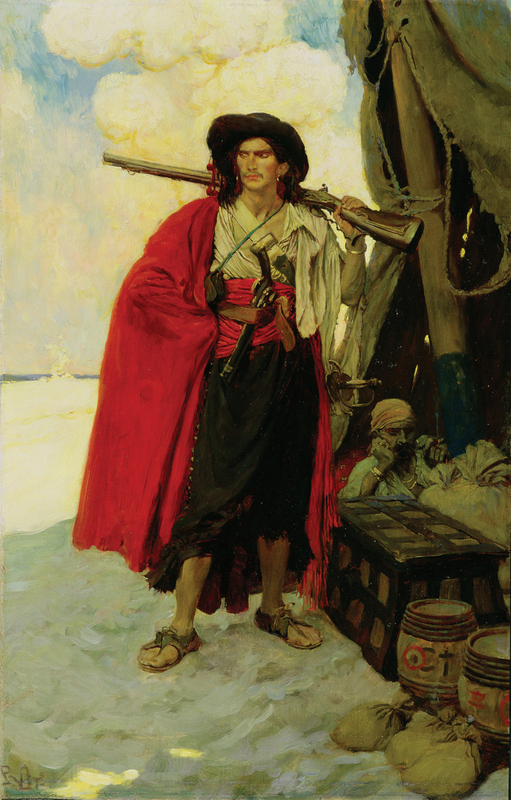 Pyle’s pirate imagery, perhaps his best known work, is a unique combination of historical accuracy and his own personal vision. His interest in authenticity is demonstrated by his archive of costume books and historic manuscripts. Recent research has revealed, however, that there was very little visual information regarding exactly what pirates wore. Pyle filled in the blanks with his vibrant imagination to create images that still shape our view of pirate clothing today. Perhaps Pyle’s strongest and most enduring images are those depicting the past and present of the United States. The American Colonial Revival was in full swing in the 1880s, and Pyle certainly joined in the enthusiasm for celebrating the nation’s history. He read voraciously, visited the sites of important events in colonial history, and collected antique costumes and furnishings. For his American history subjects, he tapped into a broad spectrum of styles and formats in both illustration and fine art, American and European, always tailoring style to format. For instance, Yankee Doodle: An Old Friend in a New Dress (1881), a children’s picture book, is illustrated in a charming, caricature-like manner that reflects the influence of the English artist, Walter Crane. Pyle’s Revolutionary War imagery, however, seems to have been inspired by the Napoleonic war imagery of the French Academic artist Jean-Louis-Ernest Meissonier. Furthermore, when illustrating contemporary life in America, Pyle, not surprisingly, seems to have looked to his compatriots for inspiration, including Winslow Homer, an artist whose work he greatly admired. Pyle’s fairy tales and children’s illustrations were informed by, and also influenced, the leading European illustrators of the day, including Kate Greenaway, Walter Crane, and Arthur Rackham. 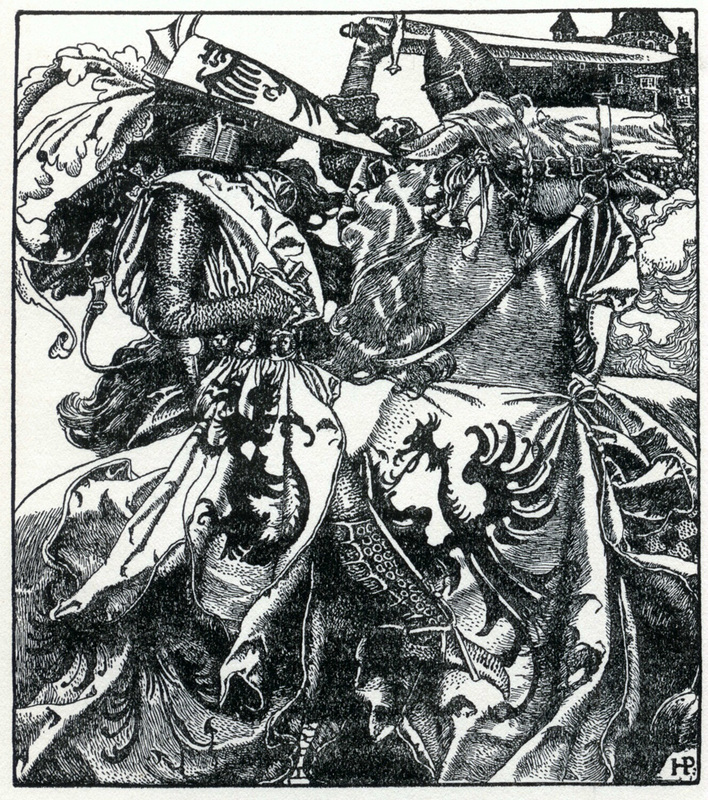 Crane wrote, “…I was interested to meet Mr. Howard Pyle, the distinguished artist, whose work I had so often admired in the American magazines.” Pyle’s Arthurian texts were clearly targeted towards children and were undoubtedly inspired by the wood engravings of the Pre-Raphaelite artists. His imagery for adult stories has a sophisticated air that suggests European aesthetic and symbolist sources. For instance, he was clearly aware of the new interest in Japanese woodblock prints expressed in the work of artists such as Edgar Degas, James Tissot, and James McNeill Whistler, and this is seen in the illustrations for his own story, North Folk Legends of the Sea (1902). His illustrations for Erik Bøgh’s The Pilgrimage of Truth (1900), display a menacing linearity that bears close resemblance to the controversial illustrations for Oscar Wilde’s retelling of Salome by the symbolist artist, Aubrey Beardsley. 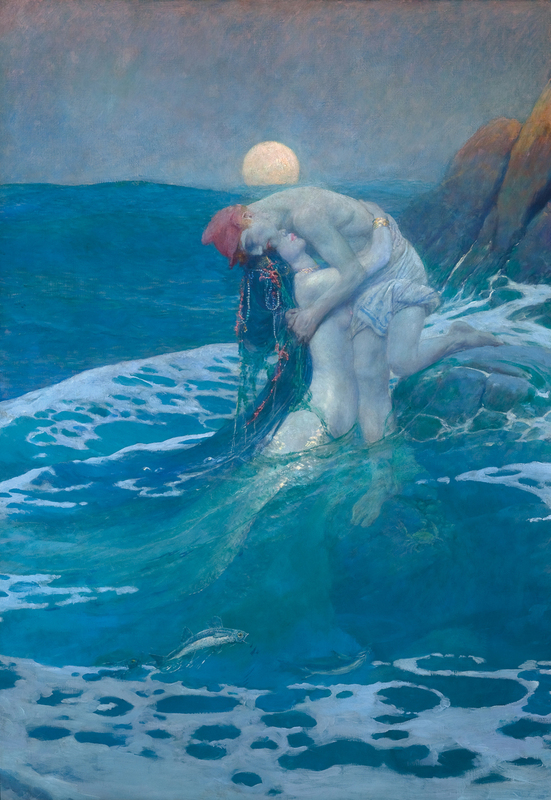 As early as 1900 Howard Pyle began thinking beyond the confines of illustration. The 1893 World’s Columbian Exposition in Chicago featured a significant number of murals, sparking a nationwide interest in public art. Pyle’s first commission, for the Minnesota Capital Building in St. Paul, was completed in 1906. During the same period—perhaps as a model for future commissions, or to develop his technique—Pyle painted a series of seven panels for the drawing room of his Wilmington home at 907 Delaware Avenue. The subject, celebrating the muses of art and literature, is variously titled the “Genus,” “Genius,” or “Birth” of Art/Literature, somewhat clouding the interpretation of the artist’s intended meaning. Nonetheless, the choice of academic subject and Beaux-Arts execution suggests a move beyond the confines of his life-defining career in American illustration. Several additional mural commissions followed, prompting Pyle’s decision to travel to Italy to study European art. In 1923 the panels were removed from the walls of Pyle’s home and installed in a specially built room in the Wilmington Public Library. They are now part of the permanent collection of the Delaware Art Museum. Agosta, Lucien L. Howard Pyle. Boston, MA: Twayne Publishers, 1987. Davis, Paul Preston. 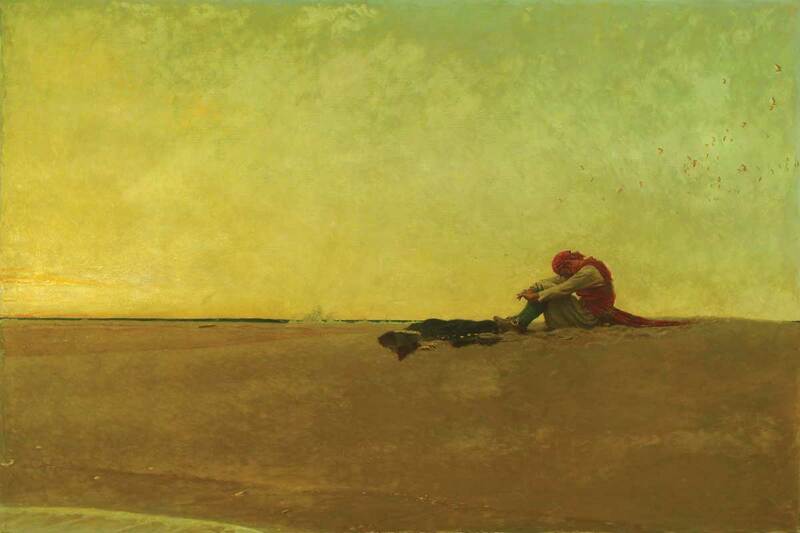 Howard Pyle: His Life, His Work. Wilmington, DE: Delaware Art Museum, 2004. May, Jill P. and Robert E. May. 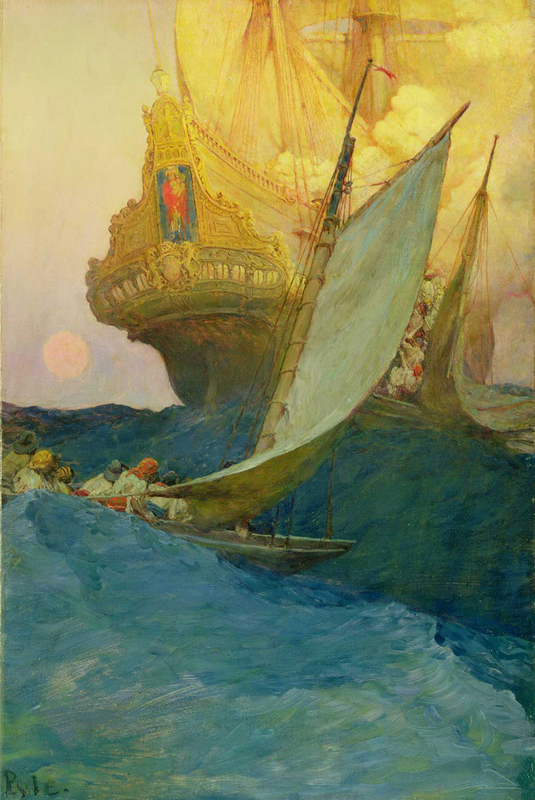 Howard Pyle: Imagining an American School of Art. Urbana, IL: University of Illinois Press, 2011. 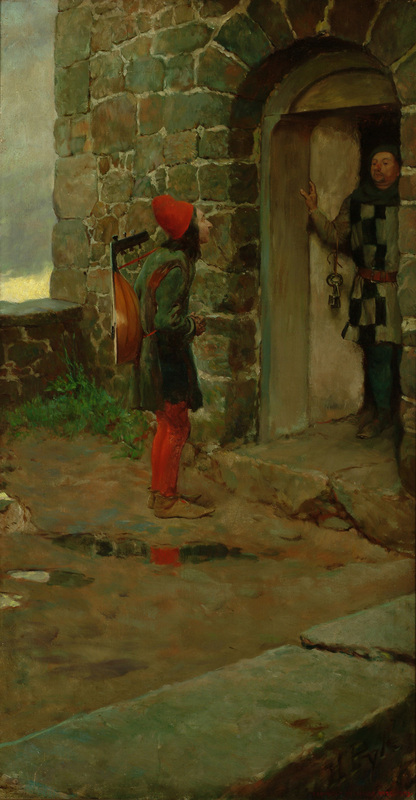 Menges, Jeff A. Pirates, Patriots, and Princesses: The Art of Howard Pyle. Mineola, NY: Dover Publications, 2006. Pyle, Howard and Deborah Kestel. The Merry Adventures of Robin Hood. New York: Baronet Books, 1883.